Welcome back, my little DIY darlings! Are you excited to discuss a stencil idea that will absolutely blow your creative little minds? It’s actually something so easy and simple that you’re gonna slap yourself right upside the head saying “Why didn’t I think of that before?” Start out by envisioning your bathroom. Now does something seem like it’s missing or doesn’t complement your existing decor? Cutting Edge Stencils wants you to consider using our stencils to create your own shower curtain! We can show you how it works to ease you into the idea! Challenge accepted? Cool! Let’s begin! I want you meet Jenna, a designer and blogger behind SAS Interiors. She is on a constant quest to integrate her DIY creations with her thrift store finds to create the perfect classic eclectic home decor feel. In other words, she’s pretty awesome! Jenna’s recent project was her kids bathroom, which was located on the second floor but it was the first thing you saw as you walked up the stairs. Her pet peeve was the length of store bought shower curtains because they’re too short and the shower head peaks out from the top. Not wanting to settle for less, Jenna’s DIY wheels starting turning. 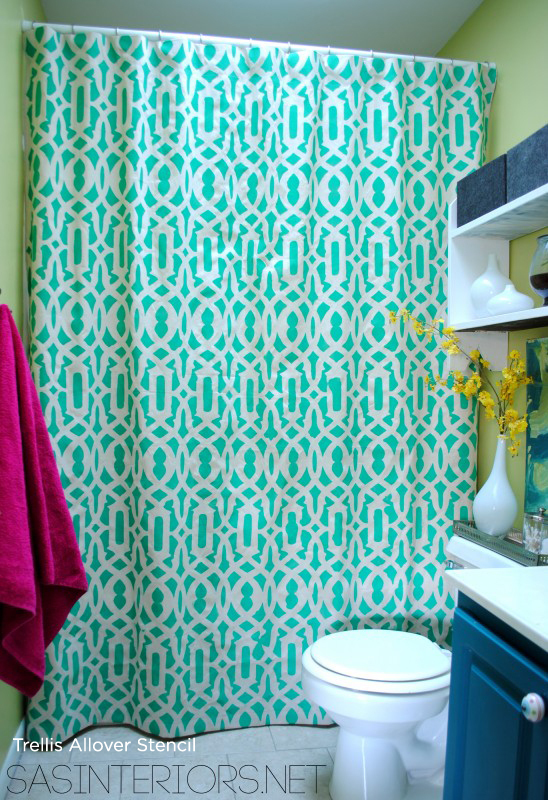 Having stenciled in the past, Jenna thought why not stencil her own shower curtain to the look she wanted. We think that’s a FAB idea! Here is what she came up with! It’s bright, bold and boy is a real eye-catcher! I bet her DIY internal goddess is singing her praise! The best part about this is that it was inexpensive and super easy so even a first time stencil novice could complete a project like this! 1. Buy a canvas drop cloth from your local home store like Lowe’s. Lay the large panel on a flat surface. Jenna used her kitchen/dining area but you could also use your garage or basement (a place that can handle a big project). 2. Secure the stencil with some painters tape and pour the paint into a paper plate. 3. Using a foam roller, carefully roll the paint over the stencil putting enough pressure on the roller so the paint adhered to the fabric, but not too much so the paint seeped under the stencil. 4. Once the first section was done, wait about 2 minutes and then carefully lifted the stencil and positioned it in the right place next to the previously painted area. Then work your way across and down until the entire drop cloth is complete. This is what it will look like when it’s done- GORGEOUS!!! 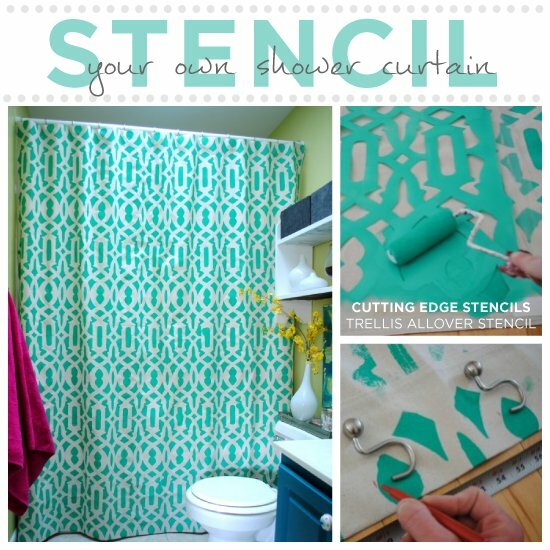 To get the tips and tricks that Jenna learned along the way and to see how she trimmed, sewed and perfected her shower curtain check out her blog post DIY Stenciled Shower Curtain. Shop our stencils and find the perfect one for your bathroom project! Are You In Love with the Indian Inlay Stencil?